Many of us have volunteered in some way at the Carrier Arboretum, and all of those activities are approved projects already. But in a recent meeting with Jan Mahon, Director, and Janis Traas, Volunteer Coordinator, I learned about so many great projects involving a push to add more native plants, including one big effort that the Project Committee hopes Headwaters Master Naturalists can mobilize to help with. First, the biggie: The Arboretum is undertaking a complete stream restoration this fall and winter, which has required several grants, and includes some basic native plantings. Their wish is for a corps of volunteers to help with that planting, but also for more sustained help with the development and planting of specialized habitat cells along the length of the stream restoration. Because the Carrier Arboretum has so many visitors, interpretive programs, and activities, it’s a great spot to introduce the public to more natives and ecological concepts. I didn’t realize they have 125 acres and only two full time staff (that’s why they’re asking for volunteers). That’s enough to keep all of us busy for years! If the Carrier Arboretum calls to you individually, email Janis at traasjm[at]jmu.edu. 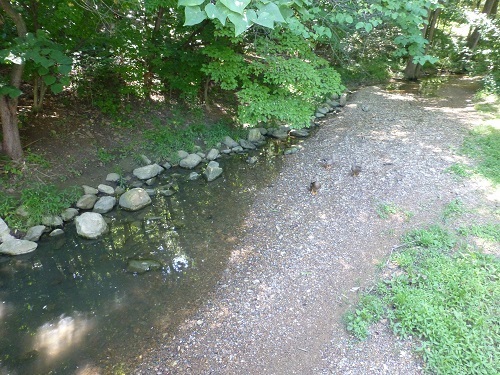 If you’d like to be the project coordinator for the Stream Restoration, to help recruit more HMN’s for a planting effort, email Sandy at greenes104[at]aol.com. Thanks to all the volunteers who already make time for the Carrier Arboretum, including Dwayne, who is there every week, and Chip with the Starry Nights program. Find some more about the Arboretum’s stream restoration planting on page 2 of their Spring Newsletter 2015. Daily News-Record reporter Amelia Brust wrote about the project as published online on January 8, 2015: Stream of Conscience. Arboretum Monarch Waystation July 31, 2015. Photo by Carl Droms. July 30, 2015 in Partner Projects.